In November of 2015, I accepted a job in Dallas, TX and left the comfort zone of my home of 21 years, Little Rock,AR. I had been trying to advance my career for years in Little Rock but nothing was hitting and I was essentially the working poor so when this opportunity in Dallas came up, I took the interview and I got the job. It was so hard leaving everything I had ever known. My friends, my family, my baking business…my city. But I knew to advance my life, I had to do it. So I came on to Dallas for this new job and was like making new friends and getting out on the scene, this gone be a breeze!!! It in fact, was not a breeze…. I had never had a hard time feeling at home or making friends but making friends past 30 is hard. Three months in, I met some great friends and was on the scene. I was traveling,partying and making connections. Then everything changed in June 2017 when I had my son. Parenthood was not in our plans, but God don’t text back. We have a beautiful little boy that is the joy of my life but motherhood and motherhood in a place with limited family and friends is a hard transition. So here I am, navigating how to find time to workout, still be fashionable with my current Mom bod, not stress eat carbs and figure motherhood out. Making time and finding outlets for myself so I don’t lose my identity in just being a mother. Stopping my body from waking up in the middle of the night even when my child is sound asleep so I can get more than 5 hours of rest. This blog is going in a different direction since my life is clearly different. Please join me in my journey, recipes will be involved. These tacos were absolutely divine. I surprised my damn self! I got some ground lamb from a local butcher. It ran me about $22 for two and a half pounds. If that is not in your budget, Kroger has ground lamb for $6.99 per pound. But I must say, the fresh lamb from the butcher is worth the extra money. I did a cucumber tomato “salsa” (it’s just like cucumber tomato salad that most southerner’s have at cookouts), an avocado crema and fresh feta cheese. Not the pre crumbled kind. In a large skillet, add 1 tbsp of olive oil and make sure the whole skillet is coated. Add the sliced garlic and sauté for about 5 minutes. Add the ground lamb to the skillet. Season with spices above. Lamb is funny and you do have to season it until the flavor goes all the way through. I added a little bit more salt and all the flavor bursts through. While the lamb is still cooking, start on the cucumber tomato salsa. Chop all ingredients into 1/2″ pieces and add to a bowl and then mix the red wine into it. set to the side. For the avocado crema, place all the ingredients into a blender until all ingredients are blended well together. Pour into bowl and set aside. Crumble the feta cheese into a small bowl. Not the water, just the cheese. Heat oven to 425. Place the tortilla shells on the middle oven rack until the puff up into a circle. Take them out the oven and place on a cookie sheet and then press down the middle with a fork to deflate it. Place the lamb in the shell, add the salsa, the cheese and then the creme on top. If you don’t want to use the crema, just add avocado. 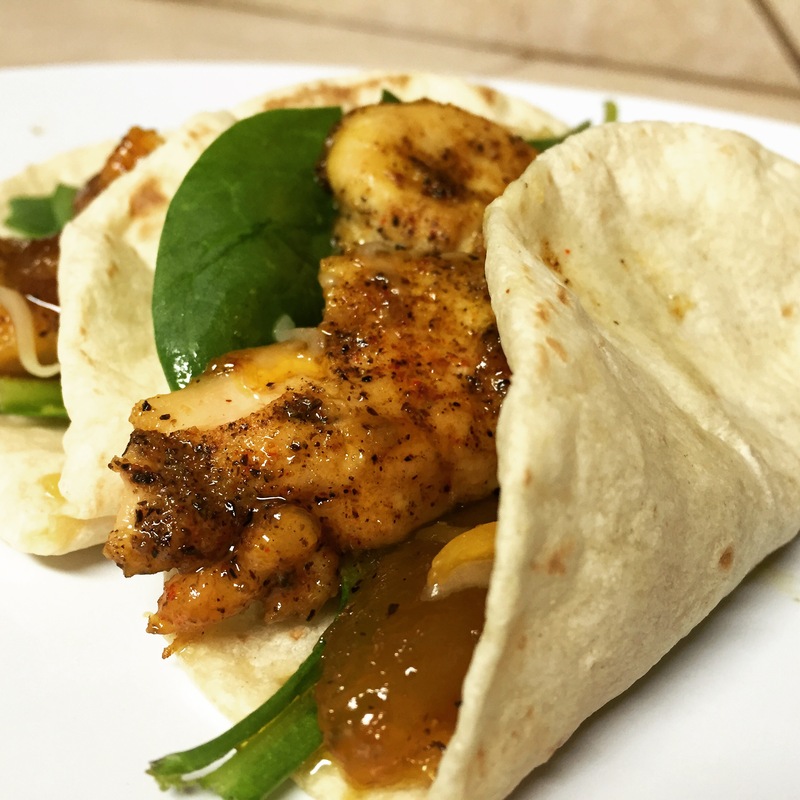 These tacos are absolutely amazing and I hope you enjoy. I wanted something different for dinner and had been saying I was going to make jerk chicken for ages so I made these tacos. I was winging it with the seasonings and it all worked out. The slaw was an experiment as well, but it was oh so good! The slaw really makes the tacos so don’t leave it off of them or you won’t get the full flavor experience. Mix all the spices except the brown sugar, together in a small bowl and place to the side. In a larger bowl, mix the olive oil and the sliced garlic together. Add the brown sugar a little at a time so that the mix does not get clumpy. If it does get clumpy, add some more olive oil. Once that is mixed well, add the other spices to the mix. If it is too thick, add more olive oil. Once the marinade is at a good consistency, put the chicken breasts in the marinade and cover with foil or saran wrap and set aside for 10 minutes. While the chicken is marinating, chop up one small onion. I prefer yellow. Heat a large skillet over medium high heat, once it is warm add one tablespoon of olive oil until the skillet is completely coated. Add the chopped onions to the olive oil and saute until translucent. Once they are translucent, add the chicken and the marinade to the skillet. Brown the chicken on both sides and then turn the eye down to medium heat. Let the chicken cook for about 12-15 minutes or until no longer pink once cut. While the chicken is cooking, start preparing the slaw. Chop the head of cabbage up into thin pieces. In a medium bowl, mix the olive oil and honey together. Add the cut up cabbage and mix. Then add the jalapeños and the cracked black pepper. I just added black pepper and honey until the slaw had the flavor I wanted so if you need more honey or black pepper, add as much or as little as you like. Once the chicken is done cooking, place on a chopping board. I get my chicken into perfect strips by sticking a large fork into the chicken and then cutting the chicken between the fork lines. Cut all the chicken up as such and then place back into the skillet. Heat your oven to 425 and then place the flour tortillas on the middle oven rack. I bake them for about 2 minutes or until they have puffed up into a circle. Remove tortillas from oven. Place your fork in the center of the shell to deflate it. You can assemble however you please, I place the slaw first, then the chicken on top. I added some Monterey jack cheese, the kind from the cheese section, not the pre packaged kind, it taste way better, trust me. And then you can add avocado or sour cream or whatever you like to the tacos for additional fixings! Just don’t forget the slaw! This is my most favorite thing to make in the winter. It is savory and delicious and surprisingly healthy. *optional- I add 3 tbsp of a Mexican beer if I have one handy. 1. Sauté onion in 1 tbsp of olive oil in a large pot until translucent. 3. Dump chicken back into the pot and add the chicken broth, beans (please wash black beans prior to adding to mixture), Rotel and seasoning mix. Bring to a boil. 4. Turn heat down to medium low and add the beer, if using, juice of half the lime and the fresh cilantro. I allow it to simmer for about 15 minutes before serving. You can simmer longer if time permits. Add your favorite chili fixins. I do avocado, tortilla chips, shredded cheese and sour cream. Pancakes are my most favorite breakfast food. I try to make some every Sunday and switch up the flavor so I don’t get bored with them. A few weeks ago, I decided to make some sweet potato pancakes. This is a perfect Sunday morning treat and I would say healthy because sweet potatoes are healthy, right? 1 sweet potato, cooked ( I used a microwaved sweet potato) peeled and mashed. 1. Mix the dry ingredients together in a large bowl. In another bowl, mix the melted butter, egg, buttermilk, and extracts together. Make a well in the dry ingredients, pour the wet ingredients in and whisk together. Then add the mashed sweet potato. It will be clumpy. 2)Melt butter on the griddle and Use a ladle or a 1/2 cup measuring spoon to pour batter on the griddle. When you see the batter bubbling, flip over and cook until done. As many of my recipes come about, I was searching for something to eat and just combined some stuff that I had handy and it was delightful. 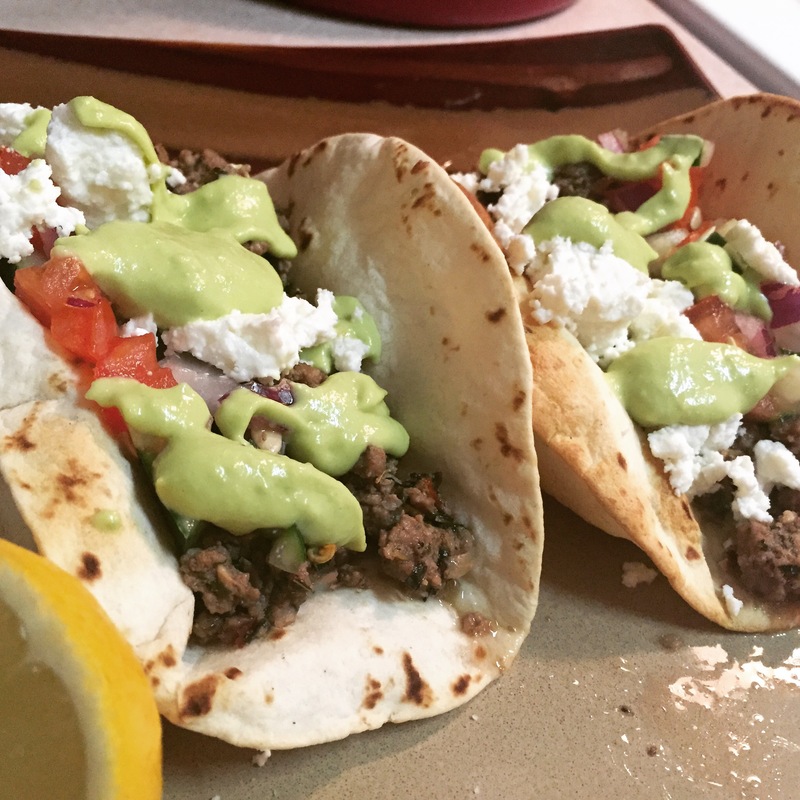 These tacos are sweet and spicy and down right succulent. 1) Turn stove to medium and place skillet on eye to warm. 3) Cook chicken (and onion if using) in olive oil until no longer pink. 4) Once the chicken is no longer pink, add the mango chutney, cayenne, cumin, and curry. Bring to a slight boil. 5) Once the mixture has started bubbling, continuously stir and then turn the heat down to low. 6) While the chicken is simmering, Heat the oven to 425. Place desired amount of flour tortillas in oven, flat. I bake them for about 2 minutes, but I like my shells a tad crunchy. If you don’t like them very crunchy, only bake for 1 minute. The shells will puff up, but once you take them out of the oven, they will flatten. 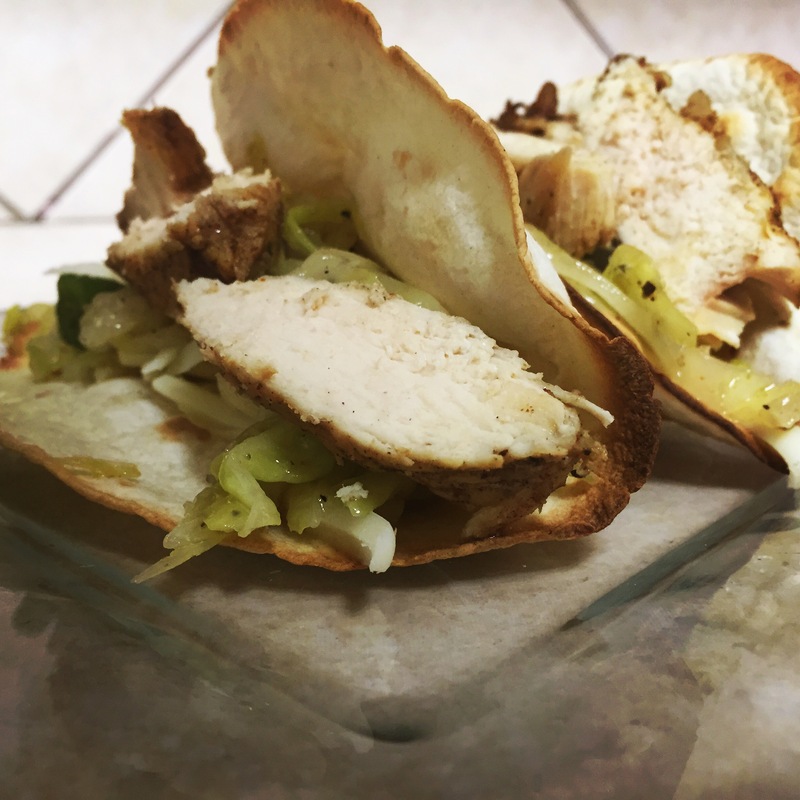 7) Place the chicken in the taco shells and dress with your favorite toppings. I use spinach, avocado, and Colby jack cheese. It’s quick and easy and delicious. One Sunday, I wanted to try something besides chicken so I decided to make a pasta with turkey Italian sausage. Once I learned how to make my own Alfredo sauce, I never looked back and I hope you don’t either! 2. While the sausage is cooking, chop up the fresh sage and mushrooms (I get pre-sliced mushrooms if available) and cook pasta according to packaged directions. 3. Once the sausage is no longer pink, remove from heat and place on a cutting board. Cut the sausage into 1″ pieces ( I achieve this by piercing the sausage with a large fork and then cutting between the two slits of the fork). Place the sausage back in the skillet with the mushrooms and the fresh sage and toss around. I add a little pepper and basil to the mixture for taste. Turn heat down to medium low and let it continue to cook. 4. Heat another skillet to medium low and melt butter. Add the sliced garlic cloves and sauté until golden brown. Add the heavy cream and stir until bubbly. Once the cream starts to form small bubbles, add the Asiago cheese and stir until all is creamy. Season sauce with Italian seasoning and a dash of salt and pepper. 5. Drain the pasta and toss the sauce and the sausage mixture together. Add cream if you would like your dish to be more creamy.